Regina T. Riphahn (born in 1965) studied in Cologne, Bonn, and at the universities of Sussex (UK), Tennessee (USA), and North Carolina (USA). She earned an MBA (Master of Business Administration) in 1990, a PhD in economics (University of North Carolina) in 1995 and a habilitation (LMU Munich) in 1999. She was professor of economic policy at the University of Mainz from 2000 to 2001 a professor of statistics and econometrics at the University of Basel (Switzerland) in 2001. Professor Riphahn holds the Chair of Empirical Economics at Friedrich-Alexander-Universität Erlangen-Nürnberg (FAU) since 2005. She is a fellow of IZA Bonn and of CESifo Munich, and a research professor at DIW Berlin. She is a member of the German Academy of Sciences (Leopoldina) and the Academic Advisory Board at the Federal Ministry for Economic Affairs and Energy. 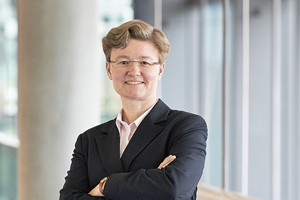 She is the co-ordinator of the Bavarian Graduate Program in Economics (BGPE), chair of the German Data Forum and of the Scientific Advisory Board at RWI Essen. Professor Riphahn’s research focuses on education, labor market and personnel economics, social policy and population economics.